A report prepared for the Judicial Conference of Australia by Associate Professor Gabrielle Appleby, Associate Professor Suzanne Le Mire, Professor Andrew Lynch and Professor Brian Opeskin. To read the report, click here. The President of the JCA, Justice Robert Beech-Jones, presented to a conference of South Australian magistrates on 8 May 2017. To read the address, click here. The JCA, in conjunction with the AIJA, conducted a Symposium on Social Media and the Courts and Tribunals in May 2016. A Background Paper was prepared for the Symposium and it can be accessed by clicking here. Justice Steven Rares, President of the JCA, presented a paper at the ‘Access to Justice – Taking the Next Steps’ Symposium held on 26 June 2015 at Monash University, organised jointly by the Australian Centre for Justice Innovation and the Australasian Institute of Judicial Administration. To view the paper, entitled ‘Is Access to Justice a Right or a Service?’, please click here. To view the 1st edition of the report, please click here. After publication of this paper, an article entitled “Facing up to Diversity? 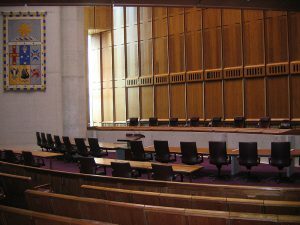 Transparency and the Reform of Commonwealth Judicial Appointments 2008 – 13” by Elizabeth Handsley and Andrew Lynch has been published in the Sydney Law Review, vol 37(2). To read this article, click here. More recently, in October 2015, the Queensland Attorney General has issued a Discussion Paper as part of a review of the judicial appointments process in Queensland. To view this discussion paper click here. As a result of these developments, and some changes in the Australian Capital Territory in regard to the appointment of Supreme Court judges, the JCA has published an updated version of its paper. To view this updated version, click here. A report prepared for the Judicial Conference of Australia by Rebecca Ananian-Welsh of the University of Queensland and Professor George Williams, AO of the University of New South Wales. To read a copy of this report click here. An article based on this report has been published in the Federal Law Review, entitled ‘Judges in Vice-Regal Roles’. To read the article, click here. A report prepared for the Judicial Conference of Australia by Professor George Williams, AO & Rebecca Ananian-Welsh of the University of New South Wales on judicial independence is now available. To read a copy of this report click here. An article based on this report has been published in the Monash University Law Review, entitled ‘Judicial Independence from the Executive: A First-Principles Review of the Australian Cases’. To read the article, click here. 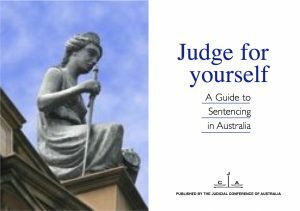 This booklet has been prepared by the Judicial Conference of Australia as a resource for the public. This booklet’s purpose is to provide, in accessible language, a guide to the sentencing of offenders in Australia. To read the guide, click here. This handbook provides basic information in order to assist judicial officers to understand better how the media works and to appreciate the factors that tend to motivate journalists in their dealings with courts. This publication is only available to members of the JCA. Enquiries may be directed to the Secretariat at secretary@jca.asn.au. Justice Philip McMurdo, the President of the Judicial Conference of Australia, delivered a speech at the Supreme and Federal Courts Judges’ Conference, held in Darwin, on 9th July 2014. To read a copy of that speech click here. The JCA has published a Position Paper on Judicial Officers’ Retirement Benefits. To read a copy of the paper, click here. To view the JCA’s submission to the Committee’s inquiry into the Migration Amendment (Removal of Mandatory Minimum Penalties) Bill 2012, click here. The following submissions were made in response to a request from the Senate Standing Committee on Legal and Constitutional Affairs, which invited the Judicial Conference of Australia to provide written submissions to two inquiries. To view the JCA’s submission to the Committee’s inquiry into the Courts Legislation Amendment (Judicial Complaints) Bill 2012 and the Judicial Misbehaviour and Incapacity (Parliamentary Commissions) Bill 2012, click here. To read the JCA view of sentencing, click here. In late 2008, the Judicial Research Project of Flinders University provided the Judicial Conference of Australia (JCA) with a brief report based on the 2007 National Survey of Australian Judges and the 2007 National Survey of Australian Magistrates. This further report expands on that earlier material, incorporating further analysis of survey data as well as material from the courts and a literature review. It considers the entire judiciary as well as distinguishing the views or experiences of judges and magistrates or judges in different types of courts, where appropriate. To read the report click here. To read the executive summary, click here. The Judicial Conference of Australia contributed to the ongoing debate and resolution of issues in regards to the handling of complaints against judicial officers. A committee, chaired by Justice David Harper, AM of the Court of Appeal of the Supreme Court of Victoria, produced two reports. An addendum to the second of these reports, reflecting the recent report of the Australian Senate’s Legal and Constitutional Affairs References Committee, was also written. To read the reports, please click here.